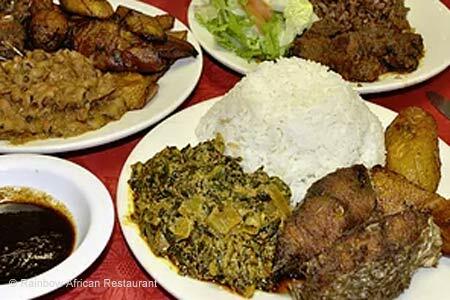 Try the fufu with goat at this West African restaurant in Gaithersburg. : This West African restaurant in Gaithersburg is an unexpected find in a seriously suburban community. Goat as you've never enjoyed it comes in various guises. We recommend the fufu with goat, a fiery chili-rich soup-stew with the cooling effects of fufu, or ground plantain, which resembles, with a little imagination, mashed potatoes. But mashed potatoes with a difference: the texture is creamy-sticky and the flavor somewhat savory. Other bests include the jerk chicken; unlike its Jamaican counterpart it is not so hot that all taste has been scorched away (the chicken is rubbed in a peppery mix). We found no desserts, but after an order of fufu with goat, who needs anything else?